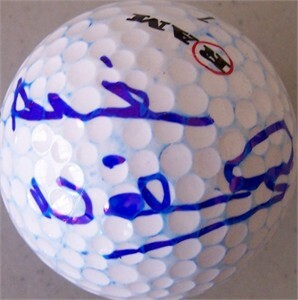 Ram golf ball autographed in blue by 1997 U.S. Women's Open winner and 2009 European Solheim Cup Team Captain Alison Nicholas. NOTE: blue ink migrated to the rest of the ball. With certificate of authenticity from AutographsForSale.com. ONLY ONE AVAILABLE FOR SALE.